Welcome to the best cheap laptops buying guide, put together by the experts at T3 to help anyone shopping for a laptop under £500. We've listed only the very best laptops under £500 on the market in 2019 and so if you're currently looking to pick up a cheap laptop deal then you're in the perfect place. 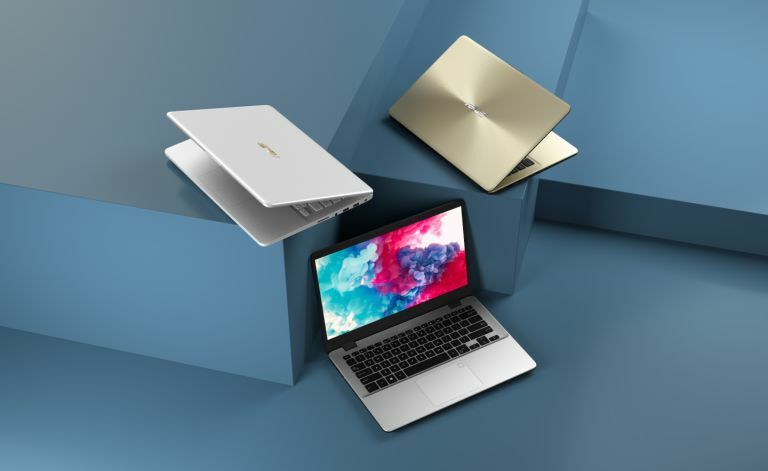 We've carefully curated this guide to save you the trouble of spending hours shopping around for the best laptops under £500 for 2019. They're all here in once place, and we'll tell you how to choose between them – how to weigh up a variety of factors including price, performance, build quality and software. Choosing a new laptop isn't always easy, with potential buyers often getting lost in a swirl of specs, size configurations, and even colour options. With that in mind it's vital that you do your homework before pulling the trigger on a new machine – and this guide is all you need to pick out the right sub-£500 laptop for you in 2019. We've weighed up the pros and cons of the devices on offer from the world's best computer makers, selecting only the top picks under £500, so you can buy with complete confidence. Those of you keeping a close eye on your budget don't necessarily have to settle for sub-par components – not at all, as we think this best laptop-under-£500 selection will demonstrate to you. Advances in technology and the appearance of cheap Chromebooks mean that you can pick up some very good deals indeed for laptops under our £500 ceiling – and we've certainly found some top systems for you to evaluate. Before we get to the best laptops under £500 on the market today though, we've also supplied some concise buying tips and advice to make sure you end up with a system that's just right for you – and one that's going to last. Buying a new laptop can be a daunting task – even more so when you're trying to find the right model to fit under a specific price limit, as we are here. A lower price range often means less powerful components, but it doesn't mean you have to settle for a cheap, throwaway product. With more impressive components now dropping in price, affordable laptops are boasting far more powerful specs, so your money goes further. It's not going to be a portable gaming beast or a media powerhouse, but you'll have enough grunt under the hood for surfing, editing documents and streaming from your favourite services. MacBooks are out of the question at this sort of price, but fortunately Windows 10 has evolved to run very well indeed on less high-end hardware. We've also included a couple of our favourite Chromebooks in the list – but remember Chrome OS requires everything to be done on the web, and you won't be able to run traditional desktop programs. Down at this end of the market, prices fluctuate regularly, and retailers will often throw in special deals to tempt buyers, so don't be surprised if some of the these prices go up and down – spend some time shopping around to work out who's got the best laptop for you at the best price. The Dell Inspiron 15 5570 is the best laptop under £500 available today. If you want to get as much for your money as you possibly can, then we'd point you towards the Inspiron 15 5570 from Dell – a company that knows what it's doing with laptops. For your cash you get a very generous 15.6-inch screen, 8GB of RAM, and 1TB of storage space, so there's plenty of room for storing photos, music and movies locally. The laptop looks the part too, and could pass for something much more expensive, though you only have one colour choice: platinum silver. USB ports abound, and there's also a HDMI connector for hooking up another screen, as well as an SD card reader. You'd be hard pressed to find a laptop that has such good looks and such high specs for less than £500. The HP Pavilion 14 is a great all-round laptop, and is available for under £500. You're going to see a lot of very good HP laptops under the £500 bracket, all with slightly different and vaguely confusing codenames. What we like about this particular model, though, is the way it combines a good all-round hardware package with a generous-sized screen, too, which is great for movie playback. Also to the laptop's credit is the B&O audio system (again useful for watching films on the go) and the generous number of ports, including HDMI out and USB-C.
Last but not least, it's quite a looker too, with silver and white your colour choices. One to consider if you're after an all-rounder that can deal very happily with your everyday computing tasks. Simply put, one of the best laptops available today for under £500. The HP Stream 14 offers a compact system for basic computing at a very low price point. If you really don't want to spend much money at all but do want to land a stylish, lightweight laptop under £500, then you should definitely consider the HP Stream 14, which retails for a bargain price point. You don't get powerful hardware for that money, with 4GB of RAM, 32GB eMMC storage, and 14-inch 1366 x 768 resolution screen your lot, but the system's battery life is competitive – and if you simply need a small system for basic computing on, why do you really need anything else? The HP Stream 14 also comes with a 1-year subscription to Office 365 and a 1TB OneDrive account, too, so it offers superb value for money. We've been fans of the Lenovo Yoga series for a while now, and the Yoga 530 series proves you don't need to spend a ton of cash to get yourself a quality Windows 2-in-1. The specs are very attractive for the price, and should help you breeze through everyday tasks no problem at all. Then you've got all the party tricks the 2-in-1 brings to the table – like that rotating hinge on the 14-inch screen, or the support for a stylus (which you'll need to buy separately). Very good value for money and very versatile too, which makes it one of the best laptops under £500 today in 2019. The Acer CB3-431 Chromebook is not just insanely light and portable, but it is also one of the best laptops under £500 going. If you can do all your computing on the web – watching Netflix, working in online office apps and email clients, checking social networks – then Chromebooks represent excellent value for money, and this one is a worthy entrant in our best laptops under £500 list. You can't install desktop programs on them, but you don't need to worry about large software updates, or antivirus software, or your system slowing over time. The 4GB of RAM and 32GB of storage you get with this Acer laptop should be enough for Chrome OS, as all you're doing is running a web browser. Meanwhile, the screen is relatively large, and offers a higher resolution than many other laptops at this price point. The HP 250 G6 is a budget buyer's ideal laptop under £500. HP makes another instalment on this list of best laptops under £500 with the HP 250 G6, a model that boasts some pretty respectable specs – making it ideal for everyday tasks including casual web surfing, editing docs and streaming, but not much more. Its display could be a little sharper and a little brighter, but with a powerful battery at its disposal this laptop is unlikely to run out of battery even if you're away from a power socket for most of the day. It won't blow you away, but it's reliable, and that's all you need at this price point. Another cracking laptop under £500 deal, the Acer Aspire 3 A315-51 delivers a robust design and plenty of connectivity options. Just because your budget has topped out at £500 doesn't mean you're bound to low-end components. That AMD Ryzen 5 2500U Processor means the Acer Aspire 3 can handle any casual task, and even deal with some light (and we mean light) gaming, too. That 15.6-inch Full HD display is very generous for a laptop in this range, and its surprisingly sharp too, while that 1TB HDD, despite not being as fast as an SSD, is huge and provides loads of storage space. The only thing that isn't ideal is the system's battery life, which at just 4.5 hours is definitely not use-all-day-off-one-charge capable. Providing you're happy carrying your charger with you, or you're using the system primarily from a desk plugged in, then this negative point can be mitigated. The 256GB SSD installed in the Asus VivoBook is very generous at this price point, providing plenty of fast storage. The ASUS VivoBook F407MA 14-inch laptop is certainly one of the more basic models in this best laptop under £500 guide, but it still has a few tricks up its sleeve that make it an attractive budget model. The spacious and fast 256GB SSD storage, for example, is one of the most generous drives on offer in a system this cheap, while the fact that it comes with a suite of useful extras – like a built-in MicroSD card reader, VGA webcam, and ICEpower audio system – means it's very versatile too. Battery life isn't the best and the CPU is strictly light computing only, but for the price, which is well below £500, you can't really ask for more. The Asus Flip C302 is one of the best laptops under £500 for Chrome OS fans. Our second Chromebook in our best laptop under £500 list for 2019 is yet more evidence of just how far £500 can take you – or in this case much less. Not only is it an excellent laptop, it doubles up as perfectly functional tablet too, thanks to the 2-in-1 form factor. You don't get all that much in terms of internal specs or storage, but remember that this is a Chromebook: all the heavy lifting is done on the web, so you won't see any system slowdowns, and you don't need to worry about installing security software or setting up backups. Also of note is the 10-hour battery life, another reason why this is definitely worth a place on our list of the best laptops under £500 on the market in 2019.